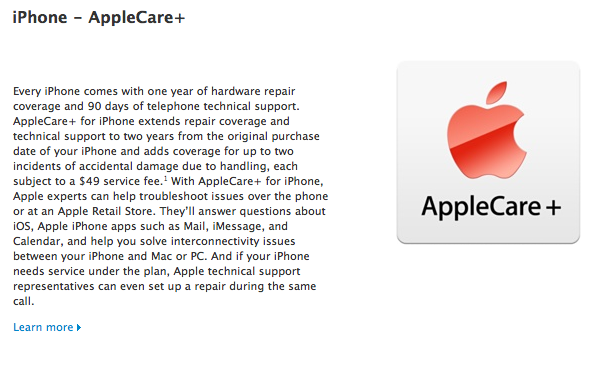 Apple (s aapl) has introduced a new level of AppleCare for iPhone shoppers, called AppleCare+. This version of Apple’s extended warranty coverage is available beginning Oct. 14 — the same day as the iPhone 4S — and covers accidental damage, unlike the previous variety. If you purchase the plan, you’ll be covered for up to two incidents of accidental destruction of your device — i.e. dropping it down a bunch of stairs. Water damage is likely also covered under this plan. You’ll be liable for a $49 service fee to get the replacement devices, but at least you won’t have to fork over for a whole new iPhone. AppleCare+ replaces the basic AppleCare package, which used to cost $69 but didn’t provide any coverage in case of accidental damage. I think it’s fair enough to charge $49 for the replacement. It’s just like an excess charge on car insurance. It allows the cost of the warranty to be reduced for all customers on the basis that a lesser estimation of the group will actually require replacement handsets. If they were to include the cost across the board, those who handle their phone with care would be penalised with an additional cost. A fan of AppleCare, mainly for laptops. I’ve had several “no questions asked” new for old replacements with a smile on the basis of AppleCare not to be a fan.